I guess when it comes to counterfeit £1 coins, I’m a bit of a geek. I’ve blogged a couple of times before about fake coins, but it’s been a while, so I thought I’d post another small bunch. If you’ve read the previous two parts in this ‘series’, you’ll probably be quite familiar with common mistakes that counterfeiters make. It never really occured to me before, but perhaps fakers intentionally make ‘errors’ so that they can distinguish their own dodgy currency lying around from the pukka stuff that can be easily spent / laundered / exchanged / banked etc…? You’ll perhaps see what I mean later. Anyway, remember, about 1 in every one hundred poind coins is supposedly counterfeit, so you’ve probably had quite a few in the past and just never noticed… read on…! As far as fake pound coins go, this isn’t bad. Actually, none of the fakes in this post are particularly poor. They could all be quite easily passed on. Here we’ve got a year 2000 coin (at least that’s what it’s stamped). We should find ourselves a nice Welsh dragon on the reverse. Oooh, we do! So far so good. I would probably say that this is one of the better quality fakes I’ve seen! The front and back are quite clearly stamped. In fact, there’s a surprising amount of detail on both sides. It’s not been stamped totally centrally, but it’s 99.9% there. You can see the slightly raised edge on the reverse side at the top right which shows it’s not quite perfect. Moving on. You can see it’s another year 2000 coin, this one has got a Celtic cross on the reverse though, not the Welsh Dragon that a genuine would have. It also has “DECUS ET TUTAMEN” incorrectly inscribed instead of “PLEIDIOL WYF I’M GWLAD”. But again, it’s the poor quality of the inscription that alerts you that this is a counterfeit coin. Probably the worst of the bunch. The colour is a bit too dark and makes it just look suspicious. I’m sure most people would think that it’s been discoloured naturally however. 1989 was a Scottish year and had a thistle on the reverse, which only goes to prove that this ’89 Ornamental Royal Arms backed coin isn’t legit. We should have had “NEMO ME IMPUNE LACESSIT” as the inscription, but yet again the fake reads “DECUS ET TUTAMEN“. 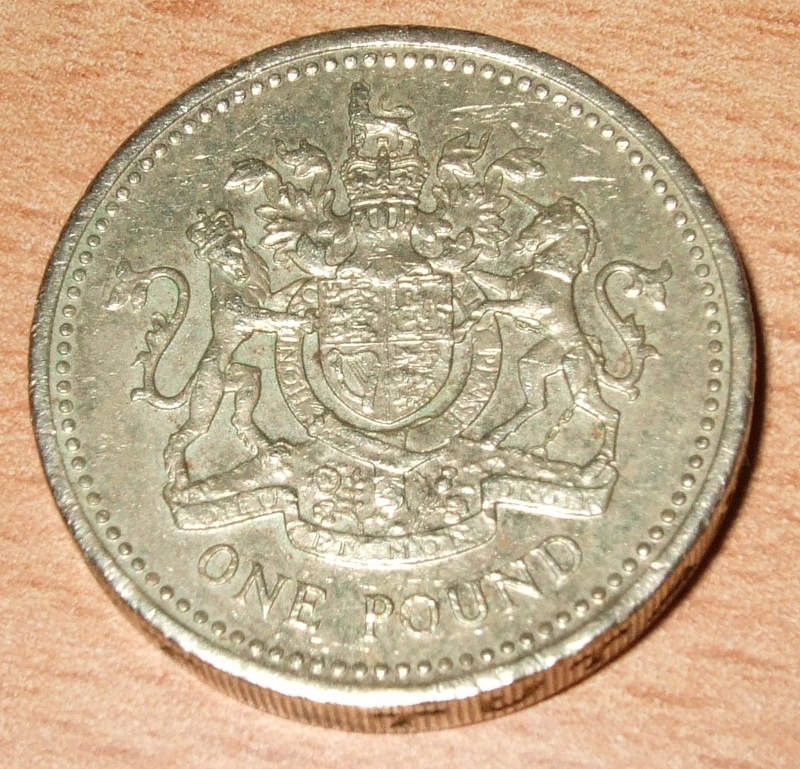 I guess this is the phrase most people associate with one pound coins, regardless of the image on the reverse. It’s very poorly inscribed and only half the coin has a milled edge. This just looks a bit dodgy! It’s difficult to explain and doesn’t really come across in the scan above, but I guess it’s the detailing on front and back which don’t look quite as sharp as it should and the colour being very slightly off. It’s been stamped 1997 and the Three Lion reverse does match correctly. Shock! Most fakes seem to have “DECUS ET TUTAMEN” inscribed around the edge, so you’d almost expect this to have it too. It’s a fakers favourite and it would also be the correct inscription after all. Rather oddly then, this one has the Welsh “PLEIDIOL WYF I’M GWLAD” instead. Hmmm, odd! It’s this coin that made me think that perhaps these mistakes aren’t always intentional. The edge has been well milled, but the lettering is pretty dire in places. I probably should of thought out this part a little more, but not to worry! The pic above has got all the coins I mentioned above, sandwiched inbetween 2 genuine coins for comparison. The first stack shows the coins lined up with the ‘cross crosslet’ I mentioned earlier. The second stack is rotated slightly to better show the quality of the lettering. I probably won’t do another of these again (“hurrah” you say! ), or at least not this angle for quite a long while. Mainly because I’ve again run out of hooky quids and also as I’ve covered most of the main ways of spotting them over the last few posts. I haven’t really covered coin weight, simply because I haven’t got an accurate enough way to measure it! My Dad has the most amazing forged £1 coin I have ever seen. It is built around a penny and a magnet and when you tap it the two parts come apart. He only realised when a parking meter spat it back and he tried the rub it on the machine trick and ended up with two bits! I never knew there were so many fakes about, I hardly ever look at the pound coins I’m given, to be honest I never thought forgers would bother with small change. Having read the blog I went and looked at my change and I think I have a fake from 2005 with the bridge on it. I’ll take a picture of it if you want but I haven’t got a scanner. 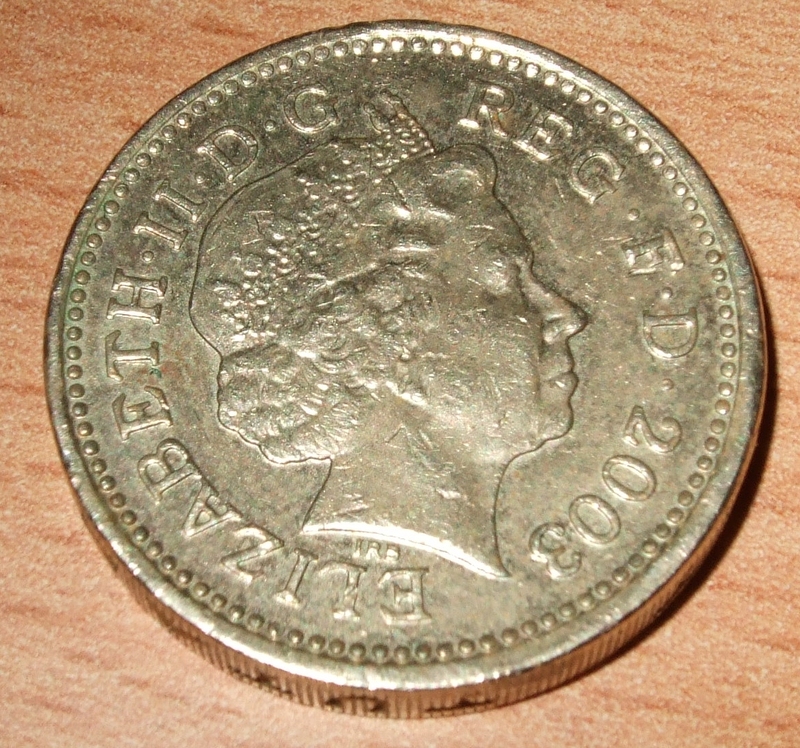 Pigtailsuk, the £1 coin – 1p piece example seems to me like a prop for a magic trick. It probably cost more to manufacture than it’s assumed value (perhaps not). How well is it built? nice blog, lots of info with examples. i been duped a few times when in a rush. as works machines won’t accept them when i cash up its taken out my pay as a ‘short’. I must say 3 years ago it was rare to get one but now there seem to be a lot more about. most are crap quality and the coins edge is the first place i look when im suspicious. Seeing the news on bbc I decided to check the single pound coin I had in my wallet and it looks pretty fishy to me. Any opinions? The typeface looks entirely wrong (against colleague’s coins), the side text looks far to deep and slanting, and even the portrait seems non standard. Andrew, I’d say that’s a fake. For starters, it’s not centrally stamped. The “IRB” initials (Ian Rank-Broadley) that should appear below the portrait instead look like a couple of blobs, and there’s no real detail on either side of the coin (the back of the crown and the shield on the reverse). But yes, the lettering around the edges does look totally wrong which is what would’ve made me look twice at that too. It might also be worth taking a look at the quality of the ‘crosslet’ between “Tutamen” and “Decus”. Does it look like a messy blob or do you see a more recognisable crosslet shape? Also, try matching it up against a real “decus et tutamen” pound and see how the letter/word spacing lines up against each other. Finally, spin it on it’s axis and see if the head and tail are the same way up. The crosslet is somewhat defined but the impresson is far too deep. It was the first thing I noticed when comparing my coin versus others in the office. It also shows how “worn” the edge markings are. The head and tail seem well alligned, perhaps not perfect but I don’t have any other coins for comparison at the moment. High resolution photos seem to make it easier to spot forgerys, now I feel compelled to examine every pound I recieve! As it happens, I’ve got a legit 2003 pound coin, so I’ve taken a few similar pics and uploaded them here, here and here. There’s a noticeable difference in detail. Wow! quite a difference in the level of detail. Happened to have 40 coins in the xmas collection. One very suspect, and a number which, without matching the criteria of year, tail stamp, edge text, may be fake. What prompted me was the news that £30M worth of coins are in circulation and I had one coin that was rejected in the drinks machine at work. Not being an expert, I made a balance out of a ruler, Swiss army Knife, two reference coins (both placed such that balance was achieved), replaced one of the reference coins with dodgey coin and re-balanced against the ruler scale. 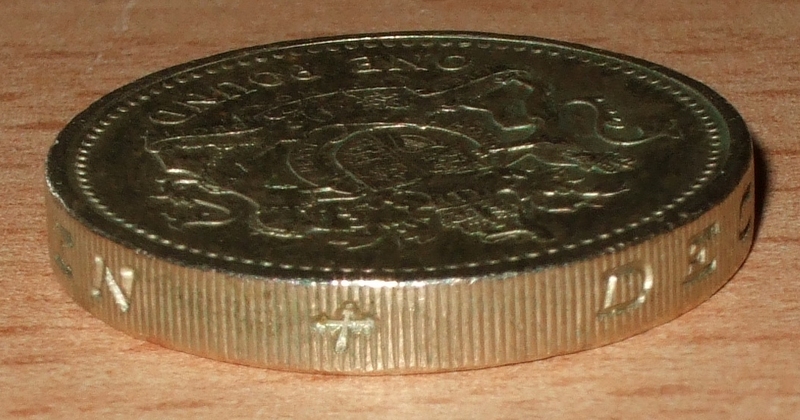 The coin that was rejected was 2mm in from the centre of the balance consistently, i.e was heavier. What that means in terms of its weight I haven’t worked out. It was also worn, but retained its colour. From a safety view point are the fakes a problem? Do they contain elements that could be absorbed through contact that are detrimental to health. It might be possible to use a file and shave metal off the coin until it is the correct weight. Presumably the machine would then recognise it, even if a human would think it an obviously damaged and faked coin. Steve, once you have given the note to the bank, they are legally obliged tokeep it, even if it is a forgery. If the bak has identified it as a forged note, it has no value. It is just a piece of paper with a ncie design on it. Sorry, but you’ve lost that tenner. Brilliant info on fake coins, congrats! Never bothered until the BBC news item this week. Went off and checked through about 45 one pound coins, most of which LOOK ok. But I have 2x 1985 coins both with the leek on the reverse and the correct text on the edge ‘PLEIDIOL WYF I’M GWLAD’, however if both coins have the leek on top (showing when laid flat), the text on the edge of one is the correct way up and the other looks upside down… if that makes sense? Not sure if this is normal or indeed which one is ok, any ideas anyone? Hi Tony, thanks! Glad you enjoyed it. Yes, that makes sense, and funnily enough, I’ve just written an answer to that very question. Spooky! I had a fake the other day! Heard about it on the news, had a look at my pound coins and the Queens head was straight, turned the coin over and the pattern on the back was upside down!! the writing was also pretty bad on it. Hi after looking at my coins in my pocket I have two 2005 one pond coins both with different bridges on and both have no writing on the edges just a criss cross pattern. Are these fakes? Hi Heather, if you have two different 2005 coins with different bridges on, then at least one of them will be fake. The ‘bridge’ series of coins (2004-2007), don’t have writing around the edge – just a couple of overlapping lines wrapping around the coin. One of the lines should be angular, the other curved. There should also be a break in the pattern with a ‘dot’ in it. I dish up a cash payroll every week and check notes with a spcial pen, never found a fake yet (would love to, just to see what one is like) but I have handled many pound coins that don’t ‘feel’ right. I have to say, unless you study pound coins it is ridiculous to expect people to know which design fits which year, and what the design should be on the rim. I see some coins that feel too smooth, look shiny but in a dull way and they just look weird. I was never told to look out for fake coins and the payroll consists of money handed over beforehand during business transaction so it never occured to me I might be given fake coins to dish out into pay packets. I shall be very careful which ones I pick for my own pay packet from now on! (The lines are much closer together. Does it say “Gibraltar” next to the Queen’s head too? If so, it’s probably not a fake. Gibraltar, The Isle of Man and a few other territories issue their own currency, that’s pegged at the same value as Sterling. Technically, it’s not legal tender in the UK, but I’m sure you really wouldn’t have any problem spending it here if you really wanted. Could still be a fake though, but you so rarely see Gibraltar/Manx/etc pound coins in this country that the chances of finding a counterfeit is pretty slim. They probably exist, I’ve just not seen any myself. Picture time! Now This should give you a better idea of it. Looks like a legit Gibraltar pound to me, sorry! I received a dodgy 2002 coin today – exactly the same problems with it as the 2003 coin covered in detail above. IRB reduced to two smudges, poor detail, off-centre. All parts match though. I did once have a fake with NEMO ME IMPUNE LACESSIT on the edge many years ago. The year, however, was a Royal Arms year (1993 IIRC), and the leek in coronet on the back (should have been a thistle with that edge) was also about 20 degrees twisted clockwise relative to the Queen. I handed it in at my bank and they didn’t believe it was a fake until I asked them to compare it with another one from the same year. When they did, they put it aside. I’ve had other fakes including one that was obviously the wrong colour and a little too big. 3. the text on the edge decus et tutamen is very very faint and the u of decus, t of et, and tutn of tutamen have all been rubbed off, as has the cross. Any thoughts from the above description…? Leave a comment for: "Fake One Pound Coins – Part Three"